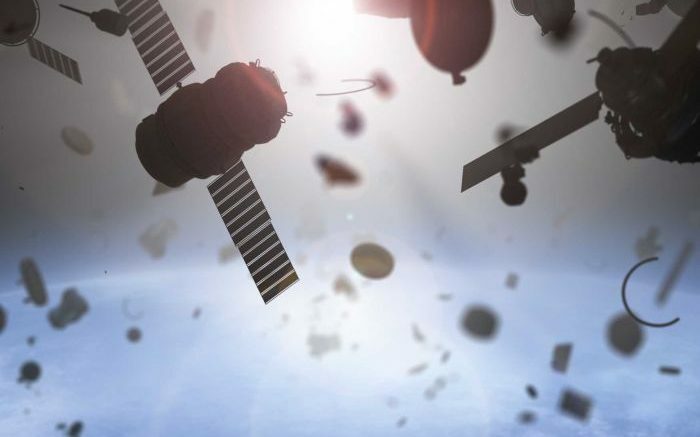 Here’s one more thing you have to worry about… space junk falling out of the sky. Not so much because it could hit you, but because today’s space junk was once a shiny new satellite. With DIRECTV broadcasting for 20 years, and its first supersized HD satellite now ten years old… should we be worried about failures? And if a satellite is solar-powered, why can’t it just last forever? First of all let’s lay those fears to rest. DIRECTV has planned well in advance and there is plenty of satellite capacity for redundancy. As older satellites are taken out of service, there’s plenty of capacity up there already, and we’re already looking forward to two new satellite launches in the future to make sure that everything stays nice and healthy. As for why a satellite can’t work forever… it’s true that the satellite’s electronics are solar-powered but its propulsion system isn’t. Satellites never just stay where they’re put… they are always drifting slightly. Every so often, they need to be moved back into position and they use onboard thrusters to get back where they should be. If the satellite were to run out of fuel, it could wander out of its assigned “parking space” into a new orbit that could threaten other satellites. Satellites are generally taken out of service long before they run out of fuel. The last of the fuel is used to move them out of their assigned spot into a spot where they can wander around with other space junk until they can be taken into a path that will see them break up harmlessly in the atmosphere. So the question is… how long does a satellite last? Most satellites are designed around a 10-year service life. All of DIRECTV’s initial fleet is now decommissioned, and its next-generation ones, the ones that launched in the early 2000s, are pretty much gone too. The actual life of a satellite really depends on how much fuel it uses during its operation. The DIRECTV-5 satellite at the 110 location is still going strong after 11 years and while there are plans to decommission it, it’s still happily serving the needs of folks in Puerto Rico. However, the DIRECTV 7S satellite, which was launched way back in 2004, is scheduled to finally end its long life in 2018. It provides standard definition programming at the 119 degree satellite location, and after fourteen years it will be long past ready to retire. Satellites that go out of service life are pushed into an even higher orbit where they pretty much stay forever, or at least until we can find some way to retrieve them safely. What is a reflector, and why do I need one? THROWBACK THURSDAY: DIRECTV bought by AT&T? How can you permanently store your DVR’s recordings?